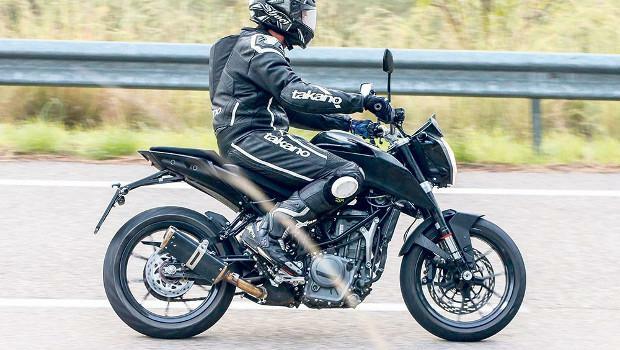 The famous Austrian motorcycle manufacturer, KTM will launch the latest generation of Duke 390. After some time ago has been caught by camera while on test in Europe, now the leaked picture that showing the half of motorcyle body without veils circulated broadly in media. As quoted from Indianautosblog on Wednesday, June 15, 2016, has recently emerged the spy photo shoot that showing the KTM Duke 390. Estimated, those photos was taken at Bajaj Auto’s Chakan plant in Maharashtra, India. The second generation of KTM Duke 390 informed will be equipped with a liquid-cooled single-cylinder engine with a capacity of 373.2 cc, and capable of producing the power up to 44 hp and a maximum torque of 35 nm. 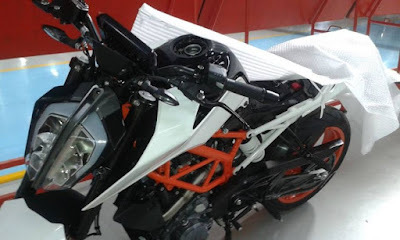 The motorcycle looks using white color combination of orange on the frame that characterizes of KTM. Changes are clearly visible at the front by using a new headlamp design. The KTM Duke 390 scheduled for launch at the EICMA exhibition which will be held on 8 to 13 November 2016 Milan, Italy.